Step 2 – There is no second step. You’re done! That’s it! 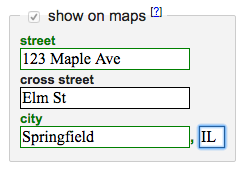 This app will find you as long as you put your full address in the correct fields when prompted. Your sale will appear in the app within 10 minutes of your post. Today, Craigslist is the most popular digital bulletin board to post and discover yard sales in the United States. Posting your sale to Craigslist is free and easy. Yard Sale Treasure Map reads your post from Craigslist and displays your sale on the largest mobile yard sale discovery platform available. While Yard Sale Treasure Map is the only official app licensed by Craigslist to show yard sale content, other websites and apps exist that illegally pirate Craigslist sale data then earn profit by showing advertisements next to the Craigslist postings. Do not be tricked into paying these “businesses” to post your sale! 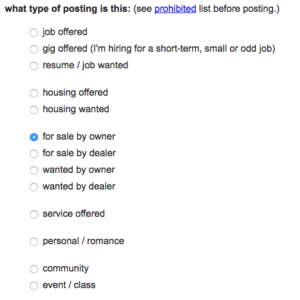 Simply post your sale on Craigslist and your sale will be visible on legal and illegal sources alike. Then after you post some signs around your neighborhood to direct traffic you can check sale advertisement off your todo list. Step 5 – Make extra sure to fill out your address! If this information is wrong or incomplete then shoppers may not find your sale. Step 6 – It is highly recommended that you add photos for your sale. Many shoppers will avoid sales that do not include at least one photo. Your sale will usually appear in the app within a few minutes, although the process may take up to half an hour. Step 10 – (optional) Find your sale in the Yard Sale Treasure Map app and choose the Promote Sale option to make your sale stand out and encourage users to view your ad.